TRIKALA, Greece -- There'll be no arguing with the driver on this bus: the rides are free and there's no driver anyway. But in Greece, a country of narrow, winding, hilly streets, stray dogs, bicycle riders and impatient drivers, the buses are up against real traffic. The Greek government had to amend its laws to allow the testing and the city had to build a dedicated bus lane that deprived residents of downtown parking spaces. The robot buses don't look like science fiction vehicles - more like golf cart meets ice-cream truck. Still, heads turn as the skinny, battery-powered buses hum through the streets. They seat only 10 people and are guided by GPS and supplementary sensors, including lasers and cameras, that send live data to a control center. 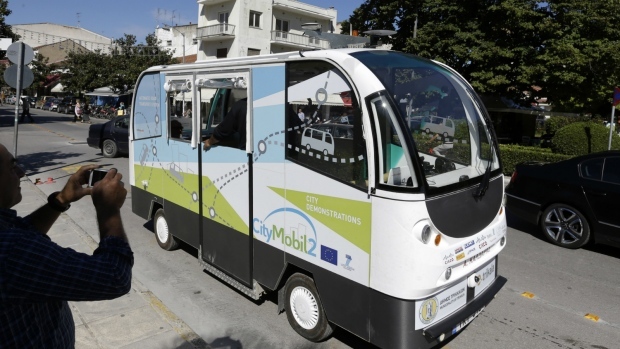 The buses go no faster than 20 kph, but the trials in Trikala potentially represent a major advance for automated transport. "There were cities bidding for this project all over Europe. They offered relatively restricted urban areas. But we said we could make it happen in a downtown environment and we won," said Odisseas Raptis, who heads the city's digital project department, e-Trikala. "We have a 2.4-kilometre route, the bus route. It's mixed with traffic, with pedestrians, with bicycles, with cars ... That hasn't been done before." Vasilis Karavidas, chief technician for the project in Greece, trained with Robosoft, the company that developed the bus, in the southwest French town of Bidart. Although the driverless buses are fully automated with onboard navigation and obstacle detection systems, each vehicle will be monitored by a driver in the control center who can override the system, Karavidas said. Trikala already has already tested EU-funded pilot medical programs, including schemes to relay heart test data from home to the doctor's office and use tracker devices for Alzheimer patients. In the center of the city, a "digital tree" with solar panels allows benches to carry phone-charging outlets. "We too often look at technological changes in isolation," said Crist. "There is a good chance that these technologies will create entirely new uses that we can only poorly grasp today. The reality is that everything is changing around these technologies and it is plausible that society may lose interest in owning cars or using fixed-service public transport - especially if these technologies allow better alternatives to emerge." Why Can't I Find an Extra Small Helmet?